Did Someone Say Happy Hour? Check out the Best Local Spots in St. Augustine! St. Augustine is a special little town known for its Spanish architecture, history, shopping and outstanding restaurants. Davidson Realty’s Graphic Designer Matt Burkhart and I recently took a trip to the oldest city in search of the best happy hour spots in town. Luckily for us, the locals were happy to point us to the three best places to stop and wet your whistle during the day! Welcome to Legacy Trail, World Golf Village’s newest single-family home community located within walking distance from the World Golf Hall of Fame, Murray Bros Caddyshack Restaurant, the IMAX theater and the Slammer & Squire golf course. Legacy Trail is offering 29 exclusive homesites that feature the signature coastal style that community builder Emerald Homes is known for. Join Davidson Realty agent Mirtha Barzaga and I for a video tour! TrailMark is a 2,278-home planned single-family community located in the peaceful backwoods of a quiet stretch of Pacetti Road in World Golf Village. The community is a beautiful display of nature with many preserved oak hammocks and gorgeous lake views. Home builders in TrailMark include D.R. Horton and Landon Homes both offering one and two story home designs available from the $200,000s. 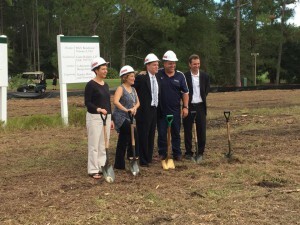 Davidson Realty President Sherry Davidson and I are back with La Fontana at the Residences’ Developer Troy White to walk the site of World Golf Village’s new and highly anticipated condominiums that recently broke ground in September. Troy gives us a look into the layout of the new buildings located in the heart of WGV, as well as an idea of the gorgeous views that future residents will enjoy year-round. World Golf Village has grown to be a friendly, close knit community with an ideal balance of natural scenery and breathtaking, high quality homes. Its newest addition, La Fontana at the Residences, is sure to add to that World Golf Village appeal with its beautiful exterior and luxurious, state-of-the-art interior. The community held its official groundbreaking ceremony on Thursday, September 25, which was hosted by developer WGV Residential Ventures I. “La Fontana, perfectly situated in St. Johns County in the heart of beautiful World Golf Village, offers baby boomers, downsizers and second home buyers the perfect maintenance-free, active Florida lifestyle,” said La Fontana Developer Troy White. Davidson Realty President Sherry Davidson and I are back this month at La Fontana at the Residences, World Golf Village’s premier condominiums located in the heart of the community. La Fontana is a new phase of The Residences condominiums and the included upgrades and lifestyle are truly superior to any you’ll find. For this video, we are joined by La Fontana’s listing agent (and Davidson Realty agent) Mirtha Barzaga to tour us around the gorgeous model. La Fontana at the Residences Condominiums – Downsize Square Footage, Not Lifestyle! This month, Davidson Realty President Sherry Davidson and I are excited to explore World Golf Village’s new premier condominium units with La Fontana at the Residences Developer Troy White. As you can see in the video, Troy could not be more passionate or excited about his new project in sunny St. Augustine. Join us to learn more about the 52 upscale condominium units offered in the heart of World Golf Village! We are back again with Lennar Homes exploring their Genesis Bonus Model in Palencia, or as Lennar refers to it, their Next Generation Home. Davidson Realty President Sherry Davidson and I got a personal tour of the “home within a home” from Tim Shillings, Lennar Homes’ New Home Consultant. Tim explains all about their distinctive product in the video above! Lennar Homes in Jacksonville and St. Augustine – Learn the Lennar Difference! This month, we are back with more on Lennar Homes and what sets them apart from other Northeast Florida builders. Davidson Realty President Sherry Davidson and I toured their Vilano (with Bonus) model with Greg Souris, New Home Sales Consultant at Lennar Homes, to spotlight some of the home’s most exciting features. Join us for our tour!